When TheyWorkForYou was built by a group of volunteer activists, many years ago, it was a first-of-a-kind website. It was novel because it imported large amounts of parliamentary data into a database-driven website, and presented it clearly and simply, and didn’t supply newspaper-style partisan editorial. These days dozens of such sites exist around the world. But today sees the launch of a rather-special new transparency site: Mzalendo, covering the Parliament of Kenya. It is entirely responsively designed, so that it works on the simplest of mobile web browsers from day one. Every organisation, position and place in the system is now a proper object in the database. So if you want to see all the politicians who went to Nairobi University, you can. 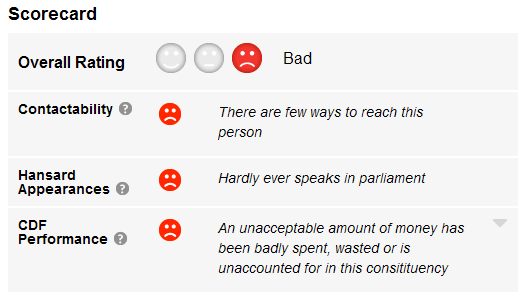 There is lots of clear information on how parliament functions, what MPs and committees do, and so on. It synthesizes some very complex National Taxpayer’s Association data on missing or wasted money into a really clear ‘scorecard‘, turning large sums of money into numbers of teachers. The codebase that Mzalendo is based on is free and open source, as always. It is a complete re-write, in a different language and framework from TheyWorkForYou, and we think it represents a great starting point for other projects. Over the next year we will be talking to people interested in using the code to run such sites in their own country. If this sounds like something of interest to you, get in touch. Meanwhile, we wish Ory and Conrad the best of luck as the site grows, and we look forward to seeing what the first users demand. Congratulations to your team, and to Mzalendo – the redesigned site strikes a good balance between simplicity and detail. Hopefully this can act as a catalyst for similar projects in the region.